Lewis Montgomery Hosea was born on 16 December, 1842, in Montgomery, Alabama, to Robert Hosea (1811-1906), a Cincinnati businessman (a steamboat owner, Bank of Cincinnati director, and wholesale produce merchant), and Harriett (Moore) Hosea (1820-1875), a young painter. The couple had ten children: Harriett (b. 1838), Harrison (b. 1840), Lewis (b. 1842), Ella (b. 1845), Lucy (b. 1847), William (b. 1848), Hattie (b. 1851), Rupert (b. 1851), Raphael (b. 1856), and Joseph (b. 1859). 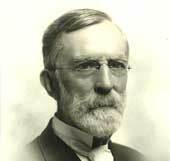 Hosea family belonged to the premier families in Cincinnati. They are of French Huguenot extraction, as their ancestors settled in the New World around the middle of 17th century, when Louis XIV gradually increased persecution of Huguenots and many of them emigrated. The first Robert (Abraham) Hosea (1675-1742), born in Virginia, established a family in North Carolina around 1700. Shortly prior to the American Revolution they removed to Boston, Massachusetts, where Robert Hosea (fifth) was born on 15 February 1811. In 1816 Robert moved with his family to Chillicothe, Ohio. In 1826 he moved to Cincinnati, became involved in mercantile pursuits, but eventually joined his father here in a steamboat supply business. In 1835 he began working the steamboats in the Mississippi and Ohio River valleys until 1844, when he came back to Cincinnati. Starting as a steamboat clerk, he soon became a captain, then an owner, then a operator and manufacturer of steamboats. He built a substantial wholesale trade in Ohio and Mississippi River commerce, and was by 1860 a man of substantial wealth, highly respected for his political acumen. A man of a variety of interests, Robert Hosea is elected to the State Legislature in 1857. In 1871 he became Mayor of Clifton, a town which he helped build. He died on 20 February, 1906. In December, 1836, Robert Hosea married to Harriett Newell Moore (then only 16 years old), of English ancestry, descended collaterally from Sir William Blackstone (1723-1780). Harriett was born in Chillicothe, Ohio, on 29 February, 1820, as the eldest child of Joseph Thoits Moore (1796-1854), a portrait painter, and his fist wife, Eleanor. Harriett became an artist and miniaturist, active in Cincinnati from 1837 to 1860, and she continued to take an active part in the art life of the city until her death there on 14 June, 1875. In 1876, after the death of Harriett, Robert Hosea married to Lucy Klinck Rice, a forty-one years younger (b. 8 Nov. 1852) woman, later the author of the novel Eastward, Or, A Buddhist Lover. Lewis Hosea returned with his family to Clifton, Cincinnati, Ohio, when he was six months old and was raised there. He was educated in the public schools of Cincinnati—Hughes High School, Brooks Classical School, and entered Antioch College at Yellow Springs, Ohio, in 1858. Lewis was still a student in the spring of 1861, when the American Civil War began. He left school in April, 1861, to join the 6th Ohio Volunteer Regiment known as the Guthrie Grays. Hosea saw action in some of the most famous and terrible battles of the Western Theater, including Shiloh, Stone’s River, Chickamauga, and Chattanooga. In April, 1865, he was brevetted Major, U.S. Regular Army, for "gallant and meritorious services at the Battle of Selma and during the Atlanta Campaign." Hosea resigned from the military service in December, 1865, and returned to Cincinnati. 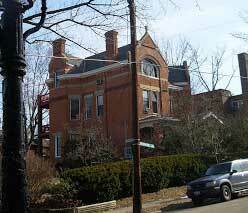 There he attended law school at the University of Cincinnati, which he graduated from in 1868. He was admitted to the bar in Ohio the same year and commenced to practice as an attorney in Cincinnati. In 1870 was assistant prosecuting attorney of Hamilton county. 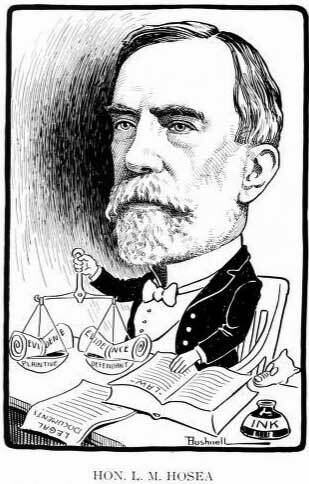 Then he founded a law firm in Cincinnati, served as a Superior Court Judge 1903-1909, and was a member of the Ohio Senate in the 75th General Assembly. 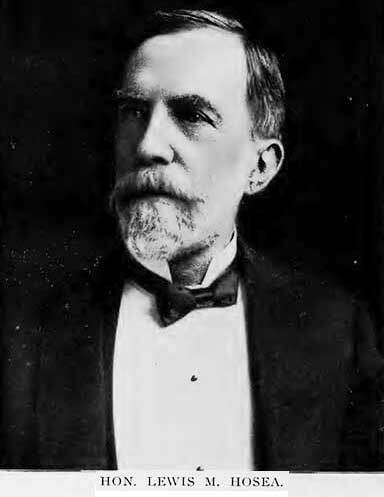 He was a Director of the Ohio Mechanical Institute there and was a founder of the School of Technology, which became the School of Engineering at University of Cincinnati. He was also a trustee of Antioch College (1913-1924). Lewis Hosea was a good mechanic and prolific inventor, and served as consulting counsel for manufacturing firms and corporations. He was a holder of many US patents for various devices like: a keyboard adding machine (see the machine of Hosea and Beardsley), velocipede (US patent 228996 from 1880), molecular pivot balance (US352753 from 1886), friction brake for cable railway cars (US379015 from 1888), hydraulic valve (US423255 from 1890), elevator valve controlling mechanism (US430125), elevator (US479943 from 1892), railway joint (US517829 from 1894), screw press (US694861 from 1902), universal joint (US960327 from 1910), and others. Lewis Hosea was a very active man and was involved in a wide range of organizations like the Cincinnati Society of Natural History, Ohio Mechanics Institute, American Association for the Advancement of Science, Literary Club and the Symphony Club. He was a secretary of the treasury at the Miami Medical College and Commissioner of the Cincinnati Industrial Exposition. In 1870s he was editor of the short-lived the Cincinnati Quarterly Journal of Science, in which in July, 1875, he published a paper, "Atlantis: A Statement of the Atlantic Theory Respecting Aboriginal Civilization", where he argued that Mayan and other early civilizations were derived from Atlantis. In 1865 Lewis Hosea married to Fanny Polk Smith (b. 13 Oct. 1840–d. 1 Jan. 1923) at Columbia, Tennessee. Fanny was a daughter of Rev. Franklin Gillette Smith (1797-1866), rector of an Episcopal School for Young Ladies, and Sarah Ann Davis Smith (1811-1871). They have had three daughters: Fanny Louise (b. 1866), Sara Davis (b. 1868), and Lida Cecilia (b. 1875). Lewis Montgomery Hosea died 82 years old of bronchial pneumonia at his residence, 2430 Brookline avenue, Clifton, on 27 January, 1924, and was buried in Spring Grove Cemetery, Cincinnati. His house in Clifton, on the corner of Brookline and Hosea Avenues, is still preserved (see the upper photo).